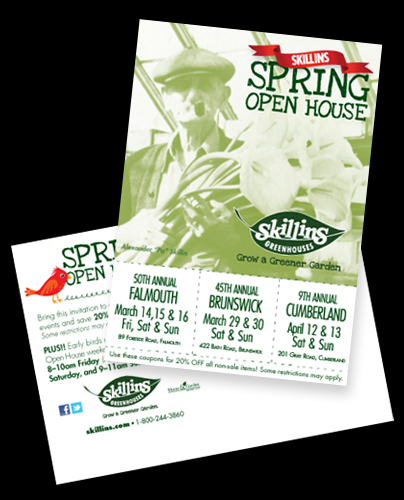 Every year Skillins Greenhouses hosts a spring open house for customers at its locations in Falmouth, Brunswick and Cumberland. The Falmouth event was special since it marked the 50th spring open house. (Skillins itself has been in business even longer, since 1885.) Terry Skillin provided us with old photos and we loved this one of Alexander “Pa” Skillin, the company founder, with calla lilies and a pipe! We made Pa the centerpiece of a campaign, and featured his photo in print ads, website, Facebook cover, posters and an invitation direct mail postcard to all Skillins customers. Radio rounded out the 50th celebration campaign.